The adored Dolly Sisters were identical twins born in Budapest in 1892. Jennie was older than Rosie by a few minutes. Named Rózsika and Janka Deutsch, as young girls they immigrated with their parents to America where they began dancing in beer halls for money. By the 1920s they were rich, they were famous and they were adored. The exotic looking, dark-skinned sisters were so similar in appearance it would be difficult for even their husbands to distinguish between them. By the time they were fourteen they had migrated to America and were enchanting vaudeville audiences in New York. Petite and dark-eyed they were as pretty as two “dollies.” The name stuck. 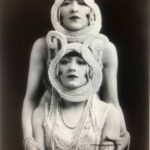 Soon the Dolly Sisters became a dream duo for Flo Ziegfeld when they joined his Follies of 1911 dancing as Siamese twin sisters. Audiences fell for the dark-haired gorgeous creatures swathed in tulle and fur, wearing towering feather head pieces. 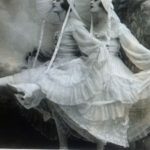 The would become known more for how many times they changed their identical couture outfits, not their dancing. They neither sang nor acted. But they were huge stars. Millionaire “Diamond Jim” Brady when he wasn’t enriching himself with shady deals was seen escorting the girls around New York, showering them with diamonds and once a Rolls- Royce. Known for his love of jewelry, Brady considered the glamorous sisters a pair of gems to flaunt on his arm. His excessive love of food, diamonds and things would match the sister’s appetite for gambling. He continued to spoil the girls through their first marriages, but when he died in 1917 those funds evaporated and to maintain their lifestyle the duo sought help elsewhere. They had developed an in satiable appetite for rich men and all the riches that could be bestowed on them. “After conquering Broadway and a few Vanderbilts, the sisters set out for London and in no time were dancing a foxtrot with Prince Edward.” For years the Price of Wales was often in the same location and the rumors spread that he was dallying with Jennie. Though he would go on to marry “that woman” Wallis Simpson. The girls spent gobs on jewelry and costumes embellished with shining crystals and bouncing bangles. 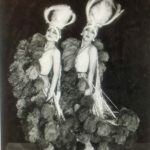 When they joined Maurice Chevalier on stage at the Casino de Paris, they were paid a whopping $58,000 a week (future fan dancer Faith Bacon was in the cast). They held a tight rein on audiences who drooled over their exuberance and charm, their slim legs and matching rosebud painted mouths. By 1922 they had set Paris ablaze. King Alfonso of Spain was a great admirer and visitor to their apartment. Nicknamed “the million dollar dollies” for the massive amount of diamonds they wound around their arms from wrist to elbows. 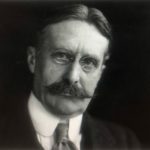 An important suitor was the much older Gordon Selfridge, the department store owner who lavished a large portion of his fortune on Jennie. For nearly a decade he pursued her relentlessly, supposedly even giving her free reign in his store. Knowing the only way to woo her was to lavish equal attention on Rose, he gifted both sisters with extravagant pieces of jewelry (once supposedly set in the shell of a pair of live tortoises). 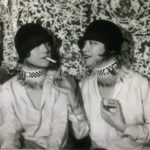 Both sisters made grand entrances into the most fashionable casinos, bejeweled, be feathered and bewitching, carelessly winning and losing millions. Many times the tab was settled by Selfridge. The Dollies were inseparable. Seemingly with money to spare the pair would retire in 1929, still in their mid-thirties, though truthfully their style of show was on the decline and they got out at the top. The continued gambling, winning and losing huge sums. It was purported lucky Jennie won four million in one night. She had a vast collection of jewelry, often given to her by admiring royalty. Jennie’s rich beau Selfridge tossed millions at her hoping she would marry him. She picked up a chateau in France. While she was contemplating jettisoning her other boyfriends for Selfridge she was in a serious car accident. It left the 41 year old beauty with a punctured lung, a cracked skull and fractured ribs, a stomach that had catapulted into her lungs and various injuries, but worst of all the right side of her face was mutilated. She underwent extensive plastic surgery on her face which was paid for by the selling of her jewelry. With her beauty gone she moaned, “I am just a broken shell.” She became seriously depressed. She returned to America and Rosie who had taken another husband. Soon Jennie was into another serious romance, finally marrying a wealthy lawyer in 1935. Jennie and her husband adopted two five-year-old girls from Budapest. 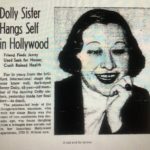 Though they weren’t related she claimed they were twins and was determined to set them up as the next generation of Dolly Sisters. But she separated from her husband and moved with her adopted daughters to Hollywood. It was there in 1941 that she couldn’t take it anymore. Gone was the fame and money and beauty. One day she telephoned an aunt to complain she was feeling ill. The aunt sensing something was wrong rushed to Jennie’s apartment. Too late. The fifty-year-old was found hanging from an iron curtain rod in the living room of her luxurious apartment. Rosie would attempt suicide in 1962, but finally succumbed to a heart attack in 1970. She was seventy-seven. 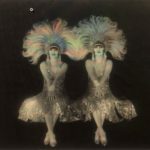 The sisters had been the epitome of the shining showgirl. They had lived for years under the white hot spot light of love, attention and riches and fame. They had lived life to the fullest, lighting up casinos and theatres on both sides of the Atlantic. Their brief time in the headlines left many admirers wishing the golden age of the showgirl had endured. But while it had, and while the Dolly Sisters had been in it the world had seemed a happier, more golden place. Fill your shaker with crushed ice then add the 2 oz vodka, 1 oz Orangecello, 1 oz orange juice, and 3 oz cream. Shake vigorously. Pour into a tall chilled glass, garnish with the chocolate shavings and a slice of orange.